The verdict was delivered at a court in Norway this morning. A COURT IN Norway has ruled that Anders Behring Breivik, who killed 77 people in Oslo last summer, must spend the next 21 years in prison. A panel of five judges has found unanimously that Breivik is criminally sane and must therefore serve his sentence in prison. He was sentenced to 21 years in prison which is the maximum sentence that can be handed down by a Norwegian court. Breivik admitted to executing a bomb attack which killed eight people and wounded 209 in central Oslo in July 2011 before he shot dead 69 people on Utoya island, 34 of whom were aged between 14 and 17. The prosecution in the case had sought an insane verdict which would have confined Breivik to a psychiatric unit. It is not clear whether or not they will appeal this morning’s verdict. Breivik had said that if he was found insane he would appeal the verdict. The 10-week trial earlier this year heard harrowing testimony from witnesses and victims of his attack on a Labour Youth Camp on the island of Utoya where people were shot dead at close range. In his own evidence Breivik outlined how he planned the attacks and outlined his far-right beliefs which he said led him to carry them out, criticising multiculturalism in the Scandinavian country. A survey taken prior to the verdict found that most Norwegians wanted Breivik to be found sane. 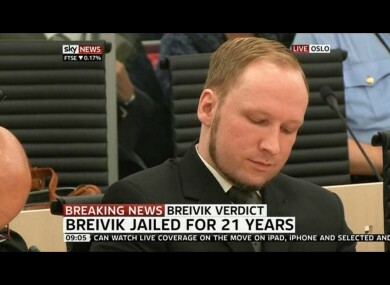 The sentence of 21 years does not necessarily mean that Breivik will be released when it concludes. According to the Norwegian courts service, a “sentence of permanent detention” is imposed if there is “considerable danger of repetition”. Though there is no specific timeframe the court always fixes one that does not exceed 21 years. After this period expires the person may be reassessed and if the court concludes that there is still a danger of repetition the timeframe may be extended by up to five years at a time. There is no limit to the number of times that this timeframe can be extended. In principle, a person that is sentenced to permanent detention can remain in prison for the rest of his or her life, the courts service says. Email “Anders Behring Breivik found to be sane, sentenced to 21 years”. Feedback on “Anders Behring Breivik found to be sane, sentenced to 21 years”.